Our example comes from the A Song of Ice and Fire books, aka Game of Thrones. We converted the e-books (epub) to text-files and used a small python program to split them into chapters, paragraphs, and sentences. You can read more about it on the NLP section of our blog. 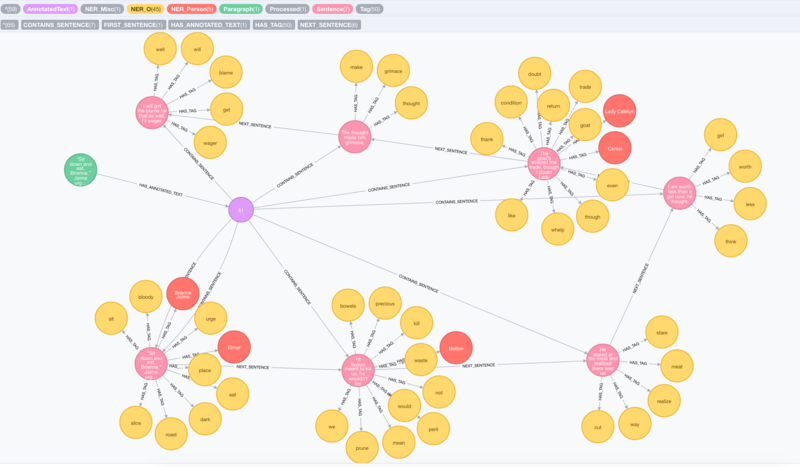 The original graph and its NLP processed representation are related with the HAS_ANNOTATED_TEXT relationship. Every paragraph is split into sentences which themselves are extracted to Tag nodes. Optionally, tags have an additional Named Entity Recognition label like NER_Person, NER_Location, etc.. Which tags/concepts were found ? It is very impressive that on this artificial text, with no real people, locations or organizations, the NLP approach still yields such correct results. 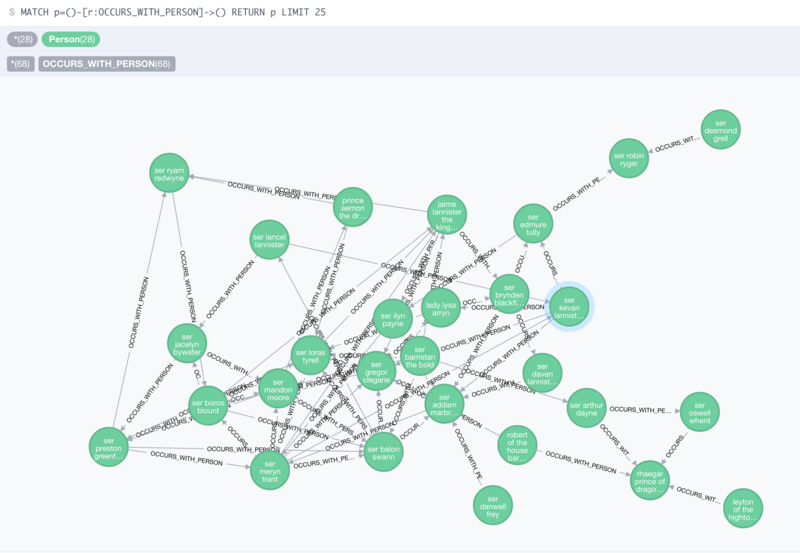 (Michael Hunger - Neo4j, Inc). Which chapter has the most different tags? While the query might look complex, it is just traversing the graph. Sentence nodes contain their position in the paragraph which make it easy to retrieve apparitions in the right order. Tag Occurrence nodes are an intermediate representation between a sentence and a tag found in it. Because Tag nodes are unique, this offers the possibility to have extra information about the occurrence of a tag in a specific sentence. Finding names and merging them together for creating person nodes. The second step is to traverse from a single name entity up to its top PART_OF relationship and traverse its own cluster in order to determine the entities to merge together. The last step is a very interesting step, because it offers us the possibility to compute again the interaction graph but with more precise Person entities than what we have done previously. We’ve made the database available (without the original text) in read-only mode here and a backup can be downloaded from Dropbox here. 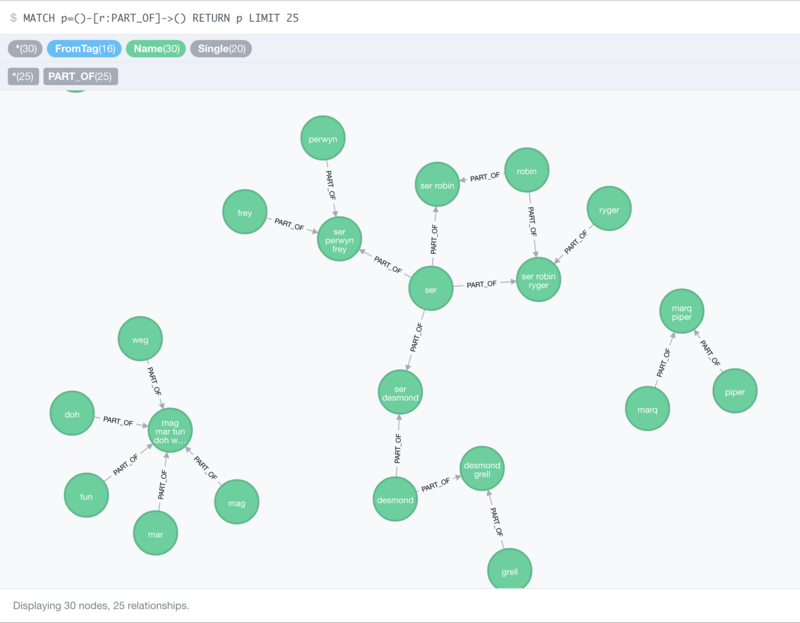 The Neo4j version used is 3.1.3. 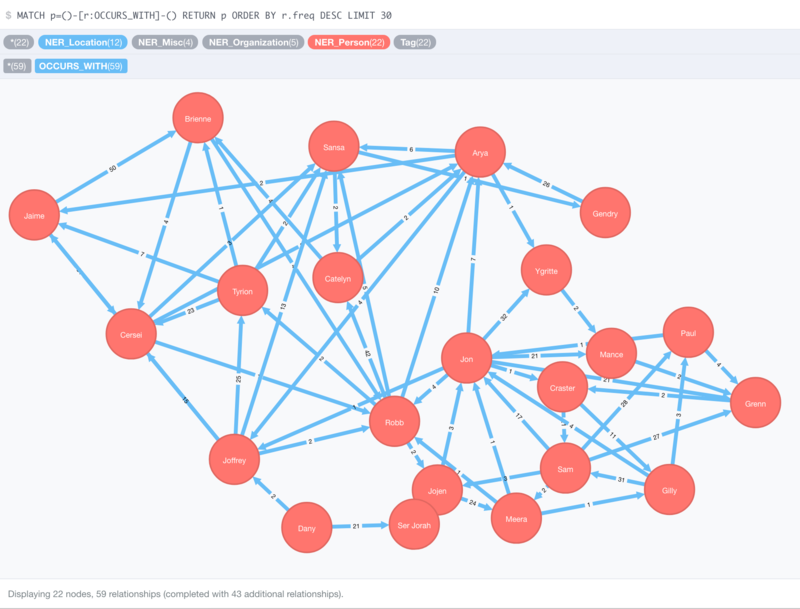 Graph Structures are ideal for storing enriched representations of textual data. 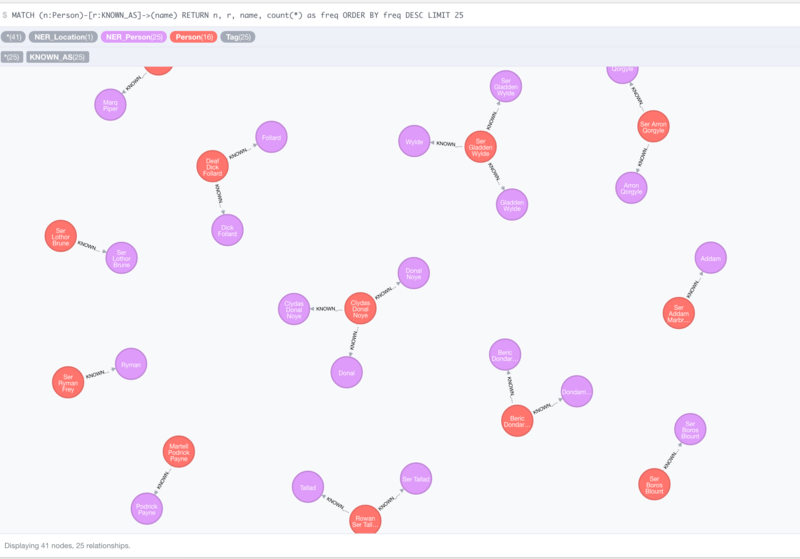 Combine this with NLP capabilities and a powerful query language for graphs and you are able to discover really interesting insights from books. GraphAware is a Gold Sponsor of GraphConnect New York, feel free to pass by our booth to learn more about the GraphAware NLP Framework.